Below are our evergreen planting instructions and other information helpful for the proper planting and care of evergreen seedlings and transplants. We sell bare root evergreen seedings and bare root evergreen transplants seasonally in Spring and Fall, evergreen plug seedlings and evergreen plug transplants about 9 months of the year. Save yourself some time and headaches! With just a bit of practice, you should be able to plant a seedling every 90 seconds. Watch our instructional planting videos on how to properly plant a tree, and do it quickly. Spring planting is best done just after frost leaves the ground, the weather is still cool, and lots of Spring rain is expected. Planting during hot, dry weather may cause “transplant shock” [also known as “thermal shock”], so either avoid planting in hot, dry weather or make sure the trees get lots of water. Drip irrigation is optimal but not always feasible [we’ll soon have an instructional video on how to build your own DIY drip irrigation system]. 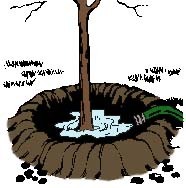 To plant your trees, work a flat spade back and forth at least a foot into the ground to create a trench, scooping out any dirt that falls into the bottom. Hold the tree by the trunk with one hand and gently push the bottoms of the roots into the very bottom of the trench with your other hand, and then pull the tree back up to ground level [if necessary] to prevent the roots from curling upwards and to get the tree at the right planting height. Once in the trench, pour a quart or more of water into the trench, allow the water to drain down a bit, and then push the trench shut with your boot. Optional: to improve watering and to help control weeds, create a circular berm around the tree and fill it with half an inch of bark or mulch. The berm will concentrate drip irrigation or a bucket of water around the roots, and the mulch will help prevent weeds. For plug seedlings and plug transplants, most of the work described above is unnecessary. You can easily plant plug seedlings using a cordless drill and any old dull rusty 1 inch drill bit you have lying around. Using a drill bit in the soil will dull it quickly, so it’s better to use an old one rather than a nice new sharp one. We have an auger which is perfectly sized for planting evergreen plug transplants stupidly fast using the identical method. Have a look at our tree seedling planting videos for detailed instructions. Evergreen trees are not susceptible to a typical Spring frost like flowers and some ornamental plants, and should be planted just after the ground thaws but before the Spring showers come to an end. In the early spring, tree seedlings are still hardened off from the winter and have no tender new growth…therefore frost does no damage. Making the mistake of waiting to plant until after the risk of frost has passed [as you would with flowers] means the best time of year to plant an evergreen seedling has long passed. The only time most tree seedlings can be damaged by frost is if it occurs at a freakishly late time in the Spring, after the trees have broken bud and tender new growth is pushing upwards. When planting, point the green end up! After a year getting acclimated to it’s new location, healthy evergreen tree seedlings will typically add 8″ to 16″ of new growth per year. The first year’s growth may be less, since bare root trees must first re-establish their root systems before putting on new growth. It is worth noting that when you are buying a tree, you should pay more attention to the root system, not the pretty top growth. Healthy root systems support healthy growth rates, and growers often show photos of their trees’ root systems to show the health and vitality of their nursery stock. As a rule of thumb, if a particular species already grows in your area, you should have great success by planting the same species. Take a drive through your neighborhood and see what species of tree seem to be growing well, and ask your neighbors if you can’t identify a particular tree. You can also check out our Evergreen Tree Buyer’s Guide for a guide on what types of evergreens do well in specific zones, soil types and sun/shade environments. We don’t recommend planting any species of tree seedling in the summer, which is why we close for the summer. A box of live seedlings sitting in a UPS truck for two days in July, are you kidding me? Most seedlings and transplants planted at this time of year will die quickly due to thermal shock and lack of adequate water from poorly established roots. However, plug seedlings are shipped with their cigar-shaped ball of soil still intact around the roots. These roots are already established in their own little dirt ecosystem and are ready to grow outwards into new dirt. This helps them avoid some of the problems of late Spring and late Fall planting, but they still need plenty of water throughout the heat of the first growing season. When planting evergreen trees in the Fall, the trees experience less stress during the digging and shipping process because they’ve gone dormant in preparation for Winter, and don’t need nearly as much water and sunlight during this dormancy as during the Spring and Summer months. Early Fall planting [Sept/Oct] also gives the trees plenty of time to become acclimated to their new environment and for the dirt to properly settle around the roots. And finally, Fall planting gives the trees a head start because they’re already in the ground in the Spring when the ground begins to thaw. Spring is obviously a fine and popular time to plant, but Fall certainly has its advantages. Having said that, “heaving out” of Fall planted trees is a concern. Bare open ground can freeze and thaw repeatedly in the Winter during sunny days and freezing nights. This repetitive freeze/thaw cycle over many days can literally squeeze the roots of a Fall-planted seedling right out of the ground because the roots are not yet anchored in the soil. Transplants are virtually immune to heaving out due to their much longer root systems, even if they’re not properly anchored yet. To prevent heaving out of a seedling, throw some mulch or bark around each tree to insulate any bare dirt from wild temperature swings on sunny days and freezing nights. Snow is the perfect ground insulator, and it’s also free! Desiccation [freeze drying] is also a concern: young evergreens can dry out from low humidity and high winds during the winter. Again, seedlings are more susceptible to desiccation than the bigger transplants. To prevent desiccation, keep the ground damp until frost sets in, and spread mulch or woodchips as an added moisture retainer. Deep snowfall also prevents desiccation, since it covers the young trees in a stabilizing winter blanket. Evergreen trees often don’t need much fertilizer, just plenty of sunshine and water. In fact, it is so easy to kill a tree by over-fertilizing that we recommend not fertilizing unless your evergreens seem to be losing their dark green color due to a shortage of nutrients. A small teaspoon of balanced fertilizer (labeled 12-12-12 or lower) sprinkled on top of the ground around and under each tree is great, but DO NOT put fertilizer directly into the planting hole…this will surely kill the trees in the same way that the way that taking an entire bottle of aspirin can kill you. Let water bring the nutrients to the roots at a slow, natural pace. We are big fans of gentle over-the-counter products such as Miracle Gro All Purpose Liquid Plant Food [all purpose], and my new favorite: Liquid Kelp Extract / Seaweed Extract [excellent root growth stimulant]. Both of these products can be applied while watering, provide excellent results, and are nearly foolproof methods for the prevention of over-fertilization. I know, because this fool who speaks to you now has killed a lot of trees with granular petroleum-based fertilizers over the years! Deer and rodents such as mice, moles and voles will eat almost anything when their normal food sources become scarce. Deer will snack on tender new growth, and will eat most of the tree if conditions are worse than normal. Deer are naturally terrified of coyotes, and you can buy spray bottles of synthetic coyote urine or Plantskydd online. Moles, voles and mice can do just as much damage, but from underground and right at the surface, eating away the tender roots and girdling the tree by eating all the bark at ground level. In the early spring, your trees will already be turning brown and can be pulled out with just two fingers because there’s no roots left. Regular inspections [pull lightly on a few trees] and poison, traps or “mouse patrol” [cats] are the only realistic solution. Mouse/mole/vole bait pellets can be inserted into a 12-18″ long length of approx 2 inch diameter PVC pipe, then lay them on the ground around the trees which you are trying to protect. The natural shape of the pipe and the enticing food inside does a very good job. The pipe also protects the poisoned food and makes it last longer, and prevents it from getting rinsed and washed away. A flag or stake marking each trap makes them easier to find in deep snow for inspection and refilling. See our evergreen tree weed control page for information on herbicides and other means of controlling weeds around your evergreen trees. See our how to pot evergreen trees page for helpful [read: urgent] tips and information on how to do it right, and the multiple gotcha’s to look out for. Your trees will finish their growth for the year around mid-July to August. Pines can be pruned after the 4th of July, while Spruce and Fir should not be pruned until Fall. If you notice your trees are not as deep a green as they used to be, sprinkle a tablespoon of 12-12-12 balanced fertilizer on top of the ground around each tree, but let the rain or your sprinkler slowly transfer the nutrients to the roots…fast fertilizing or over-fertilizing is a great way to kill your trees! Please see our evergreen windbreaks and privacy screens page for detailed information.